Ndi Igbo: Living chiefly in eastern Nigeria are the Igbos. The Igbos are an ethnic group native to the present-day south-central and southeastern Nigeria. Geographically, the Igbo homeland is divided into two unequal sections by the Niger River– an eastern (which is the larger of the two) and a western section.The Igbo people are one of the largest ethnic groups in Africa. In the igbo culture, the igbo people celebrate lots and different type of festivals. 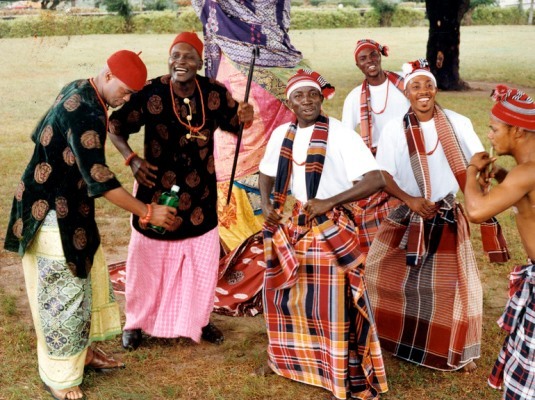 below are list of 10 most popular festivals celebrated by the Igbos. The celebration is a very culturally based occasion, tying individual Igbo communities together as essentially agrarian and dependent on yam. August, September and October are three special months in the Igbo cultural calendar. Each year, thousands of Igbo sons and daughters troop out enmass to celebrate the annual New Yam Festival. This age long festival, which is as old as the Igbo culture itself, is usually held between August and October with the date determined by each community.The aim of the New Yam Festival is to officially present the newly harvested yams to God and the ancestors of the land. The festival is also an avenue to thank God for sustaining the life of the farmers, the indigenes of the land and the farm product (yam) through a successful planting season. The New Yam Festival is indeed a colourful event which is fast becoming a major tourist attraction.. The New yam festival is celebrated throughout Igbo land and its usually accompanied with cultural music and dance, wrestling, masquerade display etc. This is the official cultural outing of the king and members of the cabinet in the year. The Ofala Festival is an annual ceremony practiced mostly by the Igbos of anambra state especially onitsha, nnewi, agulueri and ukpo etc. The festival serves as a rites of renewal of the king or Obi. The festival is celebrated within two days mostly in October by the Obi. The festival marks the end of a period of retreat sometimes called Inye Ukwu na Nlo when the Obi remains incommunicado and undergoes spiritual purification for the good of the community. At the end of the week long retreat the Obi emerges during the Ofala to bless his subjects and say prayers for the community. Ofala is celebrated annually beginning from the coronation of the Obi to his death, the latter of which is called “the last Ofala. Igboland holds many festivities and cultural performances, most notably the masquerades and the new Yam festivals. Masquerades (Mmanwu) are held in accordance with the community native calendars during festivals, annual festivities, burial rites and other social gatherings. The masquerades are geared in colourful robes and masks made of wood or fabric. Some masks appear only at one festival, but the majority appears at many or all. Masquerades are associated with spiritual elements, as according to Igbo belief, they represent images of deities or sometimes even dead relatives. The identity of the masquerade is a well-kept secret and performed exclusively by men. In the past, masquerades were regarded as the means for maintaining peace and order and were primarily used as law enforcement agents. The whole village would come out for the ceremony of the colourful masquerades. While entertaining through dances and exhibiting extra-human feats, the masquerades would walk up to certain individuals and loudly expose any bad habits, crimes or misbehavior of that person. As people would always take corrections from these exposures, the masquerades were effective in keeping up with traditional norms and values in the communities. There are annual masquerade festival in most Igbo communities called ogbako mmanwu (gathering of masquerades) where masquerades gather in village squares or open filed to entertain people. notable among the masquerade festival is the annual masquerade festival in November organised by Enugu State which involves masquerade groups from various parts of the state. The Iwa-akwa festival is one of the most beautiful Igbo festival which is been celebrated every 3years interval. The Iwa-akwa festival is a cultural heritage of the people of Okigwe senatorial district of Imo State and Enugu west senatorial district of Enugu state, mainly celebrated by the people of Ugbo in enugu state, Mbanos’, Obowos’ Etiti in imo state. Although other communities does it such as Mbaise, Orlu, Abia state and some other communities of Enugu though with a different name. This is one of the beautiful cultures that has refused to die despite the claims of Christianity which has wiped other beautiful cultures. It also attracts so many tourists both from within and outside Nigeria. The Iwa-akwa festival is a ceremony where young men who has come of age are been initiated into manhood and given the opportunities to make their contributions in social cultural and political affairs of the community. In this stage of life they can now sit with elders, wine, dine, discuss issues as it affects the community and suggests solutions. Senator Ike Ekweremadu, Governor Ugwuanyi, Hon Toby Okechukwu and others during Iwa Akwa (Aju Festival) In Ugbo. Igu Aro festivals are celebrated in some of Anambra’s communities to flag off the annual planting season.The Aro festival also called the “Igu aro” is one of the most colorful and celebrated festival in igbo land especially in Umueri . The Festival has a prime position in the life of the people due to economical importance attached to it . Because the Oracular and Prophetic utterance of the Priest depicts what would happened in a given year. This include the oracular utterances of the priest in regards on what to expect during the harvest season: Whether there will be “Ugani” (famine), Nsogbu (problem), Agha (war), Onwu (death) etc. it was a sort of annual prophecy or prediction on what would happen in the coming season. If the prophecy turns out to have positive effect, the people tend to work tiredlessly hard so as to reap the fruit of hard labour. But on contrary, they tend to be cautious during the planting season starting with the first moon of the new season. Ekpe festival is a masquerade festival celebrate mainly by the igbos of abia sate, river state and nkanu people of enugu state. unlike the mmanwu festival which is the gathering of tens and thousands of different masquerades, this masquerade festival particularly celebrates the Ekpe masquerades. Ekpe festival is a lively cultural festival that attracts people from in and outside the state. The Ekpe festival has existed for millenniums and involves so many kinds of Ekpe masquerades performing different kinds of cultural dance. Here, male and female (old and young) dress in their cultural attire, the male must tie a piece of George (wrapper) to make up for the cultural attire. Male children who have been initiated into Ekpe masquerade, and are skilled in playing the cultural music, show their expertise in their culture while the masquerade performs the dancing. People appreciate the performances of the masquerade, players and other individual dancers by donating money to them while the music is on. The apex of the cultural festival is when the Ekpe masquerade will use a cutlass and behead a goat at a strike. This festival which is more popular among the Igbos of delta state is celebrate in most western igbo communities. In Asaba, the capital city of Delta State which is one of the communities that celebrates the festival, It is a 5-day event holding in the five villages of Asaba. It is a celebration of war and of peace, and it features war dances, military-like parades, reenactment of old battles, and other related events that spice up the annual event. although with different name, the festival is also celebrated among the eastern Igbo especially in Abia state. Odo is a term used to describe the returning of the dead who spend up to six months with the living during the festival. the odo festival is celebrated among the northern Igbos of enugu state especially among the nsukka and the udi people. The odo appear as male and female masked figures played by men who are members of the death cult society, and whose identity it is required to keep secret. The Odo are first welcomed back with celebrations, and then make visits to their former homes, which result in more entertainment and gift giving. Their departure is a sad one, and engages the community in an emotional leave taking event before the Odo`s journey back. becoming more common in contemporary Odo plays. A musical accompaniment, featuring xylophones, drums, and rattles, which is known as obilenu music, meaning “that which lies above.” the development of these music groups and plays are all done in a sacred area outside of the central village where the Odo performers reside and help train new initiates to the cult. Tribal relatives from distant communities will renew their contact with their roots by spending long periods with their family while enjoying the dramatic presentations of the Odo characters. The transformation of the dead in Odo characters involve guttural speaking and large movements. Igwa nshi is a festival celebrated in Eke, udi LGA of enugu. its a celebration that reminds heros of the past victories against neighboring towns, during the festivals villages that make up the town always converge at the village square with their drums to entertain the guest. the events last for eight days. Ede festival also called ede aro festival by the abagana people of anambra state is an annual cultural festival celebrated mostly by the igbo people of Anambra and Enugu State. celebrated during the harvest of cocoyam. the ede festival is a very colourful festival that celebrates the cocoyam, Women believes that if sowing and harvesting of yam which is reserved for the males are celebrated, sowing and harvesting of cocoyam which is reserved for the female should also be celebrated. Love this! I'm not Igbo but I've always been interested in Igbo culture- the culture, the people, the photos- this whole post is beautiful! Thank you for sharing! Igbo amaka. Great write up, love my Igbo people. Awesome update. Let us always promote our culture. Proudly nwafo Igbo. Thanks for sharing cultural traditions of the Igbo. Your photos are lovely. Your page does take a while to load, but it was worth waiting. How interesting! This was so fascinating to find out about the cultures of other people. Thanks for sharing. I didn’t know this traditions, not after I read your post. The photos looks great and people seems really enjoying in every festival.